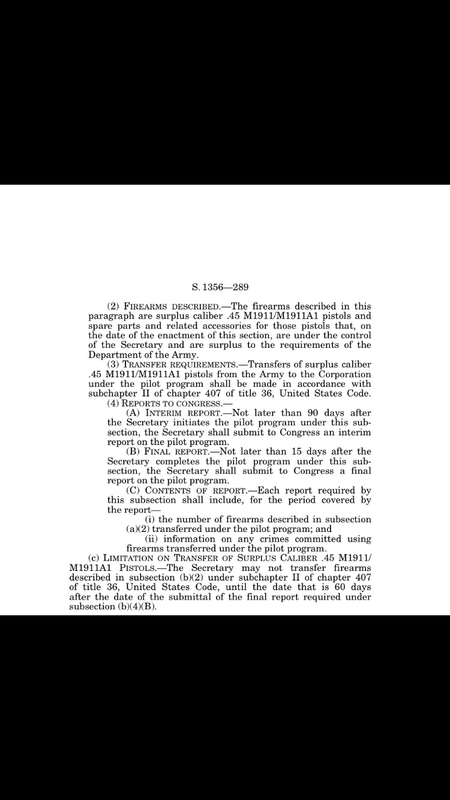 Here is the text of the 2016 NDAA pertaining to CMP 1911s. Well, it looks like the impossible happened. 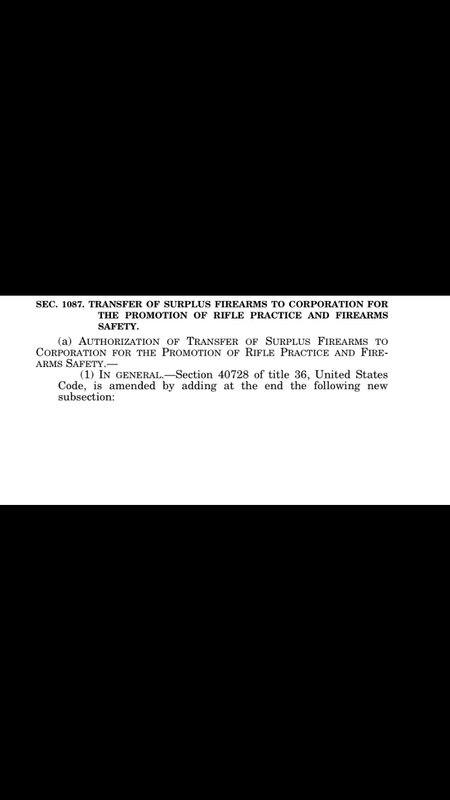 The 2016 NDAA has been signed including a provision allowing CMP to sell surplus 1911s. According to CMP it could be up to two years until they are available. Plenty of time to start saving. The NRA states in their press release that the 45 Autos will need to be sent to an FFL as opposed to home delivery like Garands. I’ve read some things around limits per year and some other regulations, but let’s wait for CMP to work out the details. Don’t expect these to be discount pistols the CMP’s mission is to promote marskmanship, not to provide subsidized pistols. The sales of these 45s will help support their mission, hopefully for many years to come. Maybe it will turn out service grade jeeps are not so far fetched after all. CMP 1911s and the NDAA: passed the senate, veto threat. 10/22/15 update: The NDAA was vetoed as a whole, not specificity because of CMP. Well, I have some crow to eat. Despite my predictions that the NDAA amendment to allow CMP to sell 1911s was probably dead, it passed the senate Thursday. Don’t start sending CMP orders for service grade Colts just yet. What this does is change CMP’s charter so they are not limited to 30 and 22 cal firearms only. 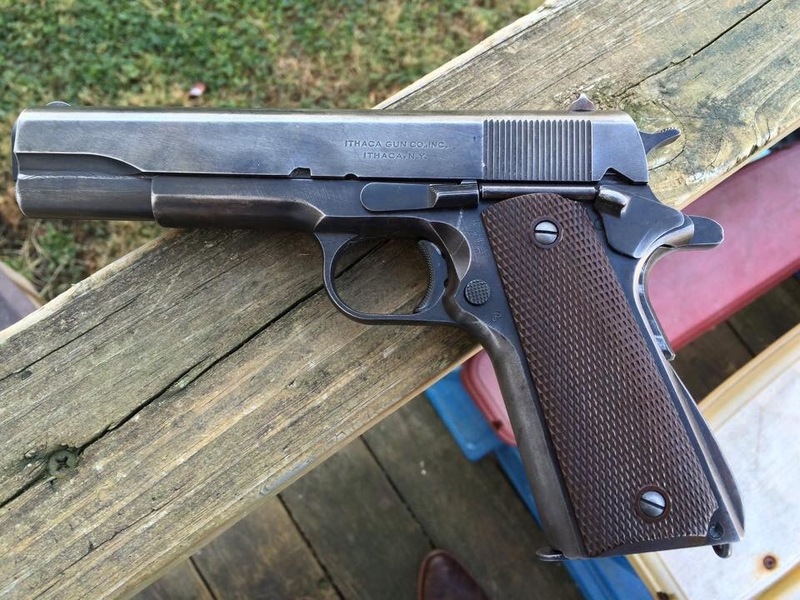 It could still be years, best case, until CMP sells 1911s. This has to be signed by Obama and he has recently threatened to veto the bill over other issues in the NDAA so it’s still anyone’s ball game. But this is very good news. Big thanks to CMP for their efforts to get it this far. Gun Control Executive Actions: CMP Garands? Don’t panic, yet. Today Obama took unilateral “executive actions” on gun control. One of these actions, may have a negative impact on our sport. Before anyone panics, the rumors of CMP’s death have been greatly exaggerated. From what I read – it has no direct impact on the CMP. Here is the release from the White House blog. – When the United States provides military firearms to its allies, either as direct commercial sales or through the foreign military sales or military assistance programs, those firearms may not be imported back into the United States without U.S. government approval. Since 2005, the U.S. Government has authorized requests to reimport more than 250,000 of these firearms. – Today, the Administration is announcing a new policy of denying requests to bring military-grade firearms back into the United States to private entities, with only a few exceptions such as for museums. This new policy will help nothing keep military-grade firearms off our streets . Based on the available information it doesn’t look to me like this will impact any future CMP Garand supplies. 1. CMP does not import anything the Army returns rifles per the law and turns them over to CMP. 2. 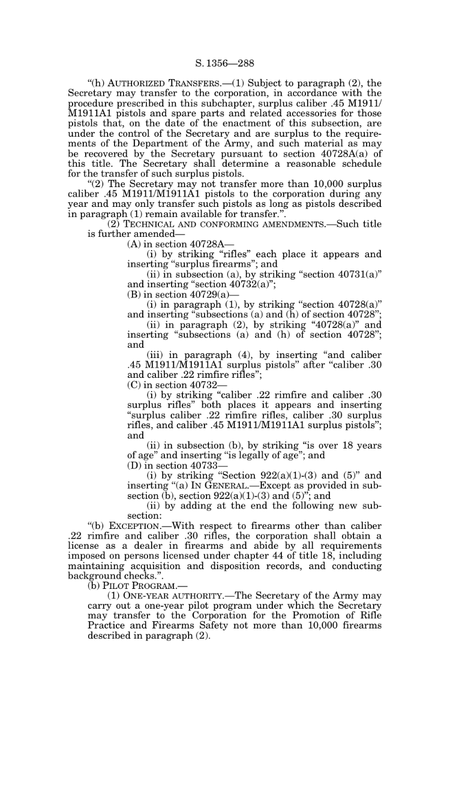 The executive action (seems to) ban the reimport of rifles that were “sold or donated.” The Army gives CMP rifles that were loaned to out to other countries. I suspect that this is specifically going after the infamous “Korean Garands” that were not going to CMP anyway. Not that that is a good thing, and don’t get me wrong I am not happy with it. This action limits the supply of Garands, and therefore new shooters to grow the sport. 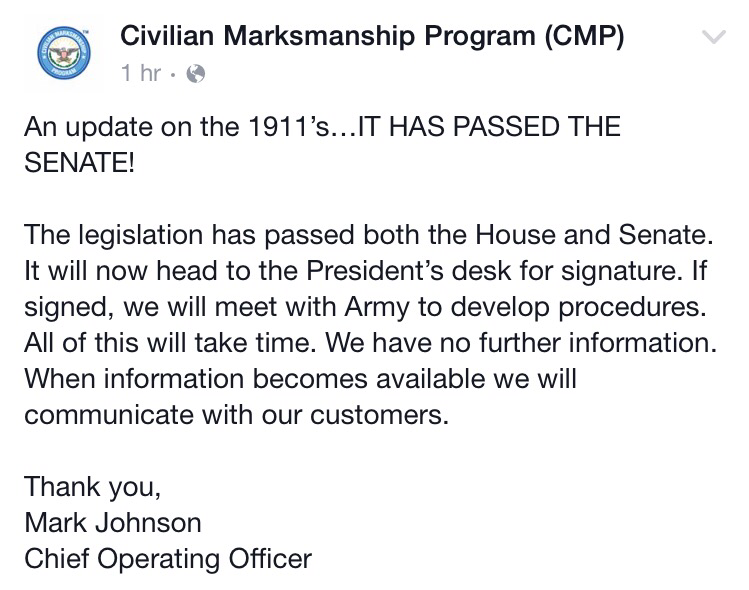 One should also keep in mind that the mission of the CMP is not to be a Garand retailer. it is an organization to promote marksmanship. So even if this action took away CMPs ability to sell Garands it would not be the end of the CMP. 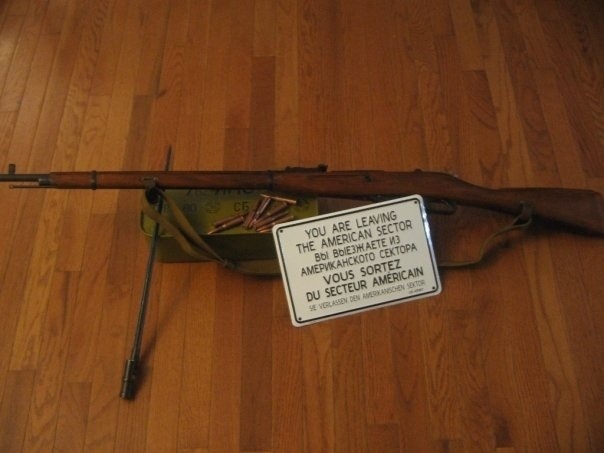 They have long since known the Garand supply will not last forever and have been planing for the future. (3) To conduct competitions in the use of firearms and to award trophies, prizes, badges, and other insignia to competitors. Furthermore Mosins and AKs won’t be impacted by this as it specifies calls out US provided rifles. If you found your way here trying to decide if you should panic buy a Garand, do it! But not because of politics but because everyone should have a Garand and learn how to shoot it!